Topped with garlic-infused olive oil instead of traditional red sauce and tasty toppings including sun-dried tomatoes, herb-cooked chicken, and feta cheese, Udi’s™ Gluten Free Pizza Crusts make the perfect base for this flavor-packed pizza! 1. Preheat oven to 400°F. 1. Heat 1 tsp. of olive oil in a medium skillet over medium high heat. Add cut-up chicken breast and season with oregano, basil and garlic powder. Cook until chicken is browned and cooked through. Set aside. 1. Lay both gluten free crusts out on a large baking sheet. Combine the minced garlic with the remaining 1 Tbsp. olive oil and brush evenly over the two crusts. Layer half of the mozzarella cheese over the oil-brushed crusts (¼ cup on each). Next, evenly layer the spinach, onions, sundried tomatoes and cooked herb chicken on crusts. 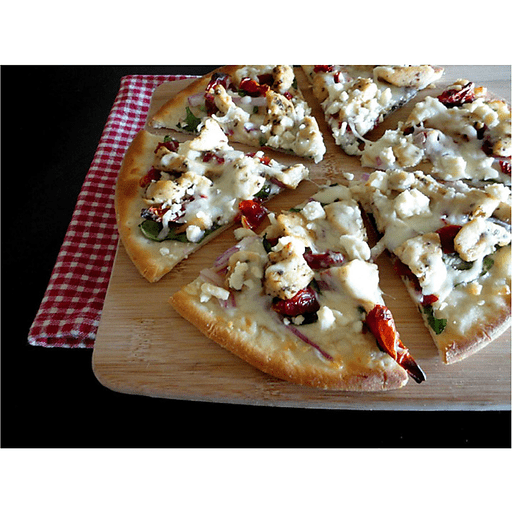 Finally, top with remaining ½ cup of mozzarella cheese (¼ cup per pizza) and sprinkle with feta cheese (2 Tbsp. per pizza). 1. Bake pizzas on the baking sheet for 12-14 minutes, or until crust becomes crispy and cheese begins to brown. Slice and serve. Calories 410, Total Fat 18g(Saturated 5g, Trans 0g), Cholesterol 45mg, Sodium 670mg, Total Carbohydrate 37g (Dietary Fiber 2g, Sugars 8g), Protein 22g, Vitamin A 10%, Vitamin C 6%, Calcium 30%, Iron 8% *Nutritional values are an approximation. Actual nutritional values may vary due to preparation techniques, variations related to suppliers, regional and seasonal differences, or rounding.